Ludwig Classic Maple Drums are some of the finest drums produced. Thankfully, Ludwig is still crafting these drums to be the standard of excellence that players revere. The L8646 “2 Up 2 Down” configuration is perfect for pretty much any musical situation. Jazz, Rock, Studio, Live, these drums are designed and built to deliver amazing tone and warm sustain. Handcrafted in Monroe North Carolina from premium North American Maple there is nothing “stock” about this kit. Each Ludwig Classic Maple drum set is built to order. Classic Maple’s standard 7-ply, 6mm shell is formulated for optimum resonance and tonality. Each drum’s bearing edge is cut to a 45-degree angle within 1/16″ from the outside edge. This sharp edge is hand-sanded to the craftsman’s touch to assure a smooth, even, flat surface for easy head seating; the final touch that completes the unmistakable Ludwig Sound. Ludwig Classic Maple Drumset Shell Packs are offered here in some of the most iconic finishes and configurations. However, because every drum is made to order you are free to customize these hand crafted drums to your personal taste and playing style. The L8646 comes configured with mini-classic lugs, Classic Brackets, and two Single Tom Holders. The sizes of the “2 Up 2 Down” kit are 16″ × 24″ Bass, 14″ × 16″ Floor, 12″ × 14″ Floor, 8″ × 10″ Tom, 9″ × 12″ Tom, with a 5″ × 14″ Wood Snare. If you require a hardware pack or other customization to your Ludwig Classic Maple Drums, just download the Classic Maple Configuration Guide and call a Steve Weiss Music sales associate for assistance. 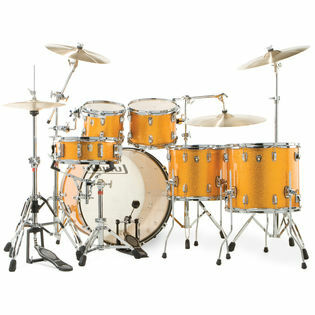 Because all Ludwig Maple Classic Drums are made to order, please allow 6-8 weeks for delivery. Allow 12 weeks for lacquer finishes.